A damaged heat exchanger is a cause for concern for many reasons. Initially, the heating in the home might falter, resulting in a chilly home. Next is a sometimes expensive repair bill. But if left unchecked, a broken or damaged heat exchanger can result in far more serious damages. The release of carbon monoxide is a very real concern with damaged heat exchangers. Today, the Heat Exchange Experts will outline the signs of carbon monoxide poisoning. Any gas, oil, or wood furnace or stove in the home produces carbon monoxide as a by-product of burning these fuels for heat. Typically, propane and natural gas burns very cleanly, but they do produce carbon monoxide in small amounts during the combustion process. When a heat exchanger works properly, these harmful by-products are safely piped out of the home, and away from the occupants. However, if the heat exchanger is cracked, rusted or has failed in another way, carbon monoxide can begin leaking into the home itself. What Does Carbon Monoxide Poisoning Look Like? As a substance, carbon monoxide is colorless, odorless, and tasteless. This gas is produced when fuels are burned. CO can build up in a space if it’s not properly vented. Carbon monoxide poisoning then is when CO builds up in your bloodstream. Your body starts replacing its blood cells with the CO it has been exposed to. The lack of blood prevents your muscles and tissues from getting the nutrients they need to function normally. This build-up can eventually lead to major health concerns like tissue damage, and in some cases, death. Much like the gas itself, CO poisoning manifests in subtle ways that many may initially dismiss. These subtle signs and symptoms include things like feeling a dull, persistent headache. Others have reported feeling muscle fatigue and weakness. Complaints of dizziness can quickly change to a sense of nausea, that may lead to vomiting. More obvious, and concerning signs include shortness of breath. Individuals who have carbon monoxide poisoning may feel confused and have blurred vision. In some cases, loss of consciousness can occur. 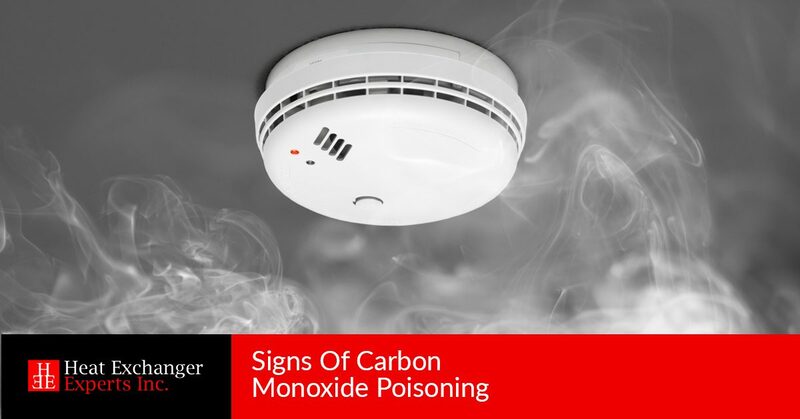 Carbon monoxide is especially hazardous to those who are resting. When sleeping, individuals may not manifest these signs, or recognize that they’re being affected in any way. Similarly, individuals who are intoxicated may conflate the signs of CO poisoning with being impaired in another way. Individuals in these cases are more likely to experience the serious side effects of CO poisoning, like brain damage, and death. If you fear you’ve been exposed to an excess of carbon monoxide, you can begin treatment by leaving the home and breathing normally outside for several minutes. It is advisable to seek emergency medical care after that. Preventing CO poisoning is fairly simple. Ensuring that your heat exchanger is in good working order is a regular part of homeownership. CO detectors can be installed throughout the home that will sound an alarm when a build-up of the gas is detected. The Heat Exchange Experts are also expert witnesses when it comes to carbon monoxide poisoning cases. If you need an expert witness in a case related to a damaged heat exchanger, don’t hesitate to reach out and request our help.